9' Telescope Casual Commercial Market Umbrella 9' Powdercoat Aluminum. 19 lbs. 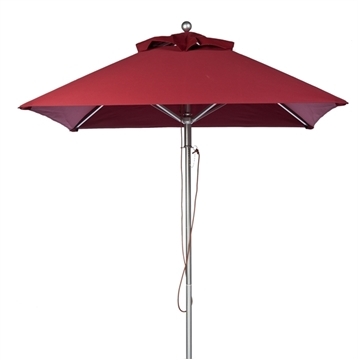 Our aluminum rib contract umbrellas utilize commercial quality materials built for outdoor exposure all day in the sun at your hotel or resort. The marine grade fabric will not wear and fade over time and will maintain its color vibrancy for years. The square aluminum ribs are more durable than the traditional wire or round ribs. The aluminum frames are silver coated to protect against peeling and rotting from the sun and bad weather. Give us a call to discuss finding the right umbrella for you and receive your own personalized quote.